Rett's paintings are really amazingly beautiful. ﻿This one is titled Small Neat Worlds II. 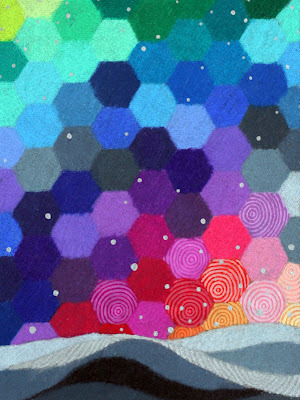 I secretly think Rett, in her heart of hearts, is also a quilter. She just doesn't use fabric. ﻿Either way, I fell in love with A Tree Grows when I found it on Pinterest and repinned it onto my "Amazing Quilts" board knowing someday I wanted to recreate this magical design. I have been obsessed this week. Monday I pondered, picked, cut and rejected 3" square pieces of fabric for the sky, grass and tree. Found a lay out for the sky and grass I liked. I used muslin to fill in where the tree would be appliqued. Tuesday, things are just pinned in place on a makeshift design wall. Okay. It's cool. I like where it's going. Wednesday I traced my tree trunk and branches onto a paper template for the circle using a grid process to determine placement of the branches. I then cut out the pattern and used Heat'n Bond from Joann's to fuse the dark brown batik fabric chosen for the tree and ironed it onto the circle. Our oldest and nextest went hiking in the afternoon and youngest was at his school so that left the me time to cut out the small "lights", place them where I wanted them and iron them down. This time, the smaller compass did work for the small circles of yellow Kona. Thursday, I added a few more medium and small circles out more into the sky. if I want to take this further in design. extend it down vertically with sashing and ?????? quilt the trunk and branches with white, or gray thread? I think I'll meander a bit around the sky and treetop for quilting and then hand quilt around the lights. French knots will be the tiny lights too small to cut and fuse to the piece. I'm very pleased with this so far, and suggestions are always welcome! Another "finish" I'm happy to report is Lady's new collar. Another tutorial on Pinterest helped me use Moda's Birdie fabric to craft a replacement for the ratty old one she was wearing. Saved me about $7-10 dollars! Linking up with Amanda Jean for Finish It Up Friday﻿ and with Megan for Sew Modern Monday. I love it! There's a pinterest challenge over at bower power I think you should enter. Very pretty. I would definitely try some light color quilting on the trunk to play it up. It will be great what ever you do! i show the painting and thought the same thing- a quilt....i agree, you should enter the pinterest challenge! 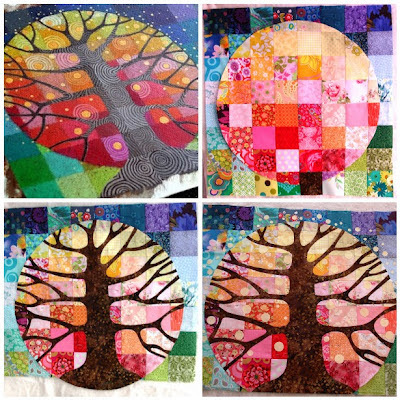 Unbelievably gorgeous quilt...I adore trees in quilts and so this is top notch. Your colors are popping all over wonderfully!! it might be kind of neat if you want it longer to repeat the theme in a root type fashion. dark brown/mahogany dirt with nice bright green/sage roots to emphasize the branching, but perhaps smaller. Wow, this is fantastic! 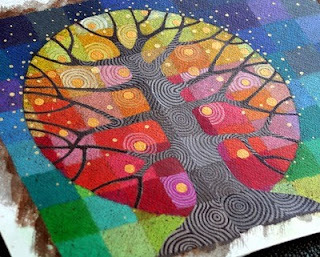 I would use white thread on the tree quilting. Otherwise I wouldn't change a thing! Oh, wow! Thanks for sharing your creative process. I think you should do swirly/bark-like quilting with tan/brown thread. LOL! I love the idea that she's a quilter who doesn't love fabric. These projects are amazing :-) I love to see how you are inspired! Thanks for leaving a comment on my post "A little tea party". I enjoy getting comments. And this one....WOW!! I LOVE it! I love hers and yours!!! I wouldn't sash or border... as is works best. I hope that you contact the artist to show how much her works influenced you. this is so pretty. the warm colors against the cold and then the tree. such a beautiful balace! You did a fantastic job on that!! So beautiful Dee - love how you have done the tree! Wow, it's really cool to see the process. This is gorgeous! wow! that is just amazing! Can't wait to see it finished. So beautiful! You know I love your amazing Swoon, too. A little Liebster blog love came into my life, and I'm happy to pass the Liebster Blog Award on to you! This is amazing, and so SO beautiful! You are nailing it my friend! Jaw dropping gorgeous! Sorry about only seeing this now. I haven't gotten much time lately. Your tree is truly amazing! Absolutely beautiful...and I hope you get the artist's permission before further promoting/sharing/selling it, since the image belongs to her. Dee, this is simply stunning!!! Love, love, love this!